McCaskill Says Her 'Jaw Dropped' at $1k Cost for GOP Fundraiser with Trump. It Cost $98k to Host Her Fundraiser with Obama. Sen. Claire McCaskill (D., Mo.) 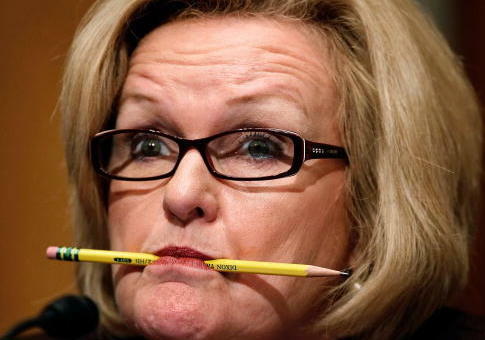 wrote in an email to supporters that her "jaw dropped" at the $1,000 price tag for her Republican opponent Josh Hawley's fundraiser with President Donald Trump, but campaign filings show McCaskill had an even higher price tag for her fundraiser with former President Barack Obama. 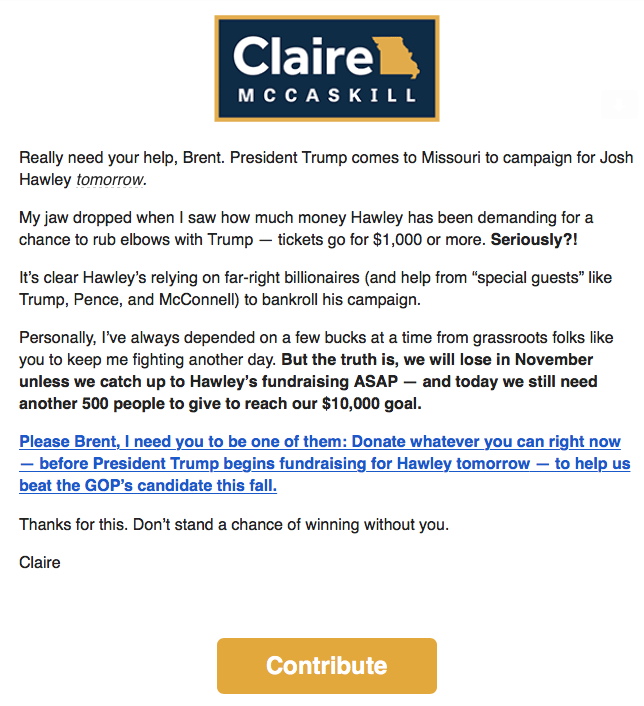 "My jaw dropped when I saw how much money Hawley has been demanding for a chance to rub elbows with Trump—tickets go for $1,000 or more," McCaskill wrote in a fundraising email. She goes on to say, "Hawley's relying on far-right billionaires" while she's "always depended on a few bucks at a time from grassroots folks like you to keep me fighting another day." "Donate whatever you can right now—before President Trump begins fundraising for Hawley tomorrow—to help us beat the GOP’s candidate this fall," McCaskill concludes. "Don't stand a chance of winning without you." Fundraising emails often take on the desperate tone exhibited by McCaskill, but her claim of being shocked by the fundraiser's price tag is hard to believe given her own fundraising history. When McCaskill was joined by Obama for a Beverly Hills fundraiser earlier this year, campaign finance filings indicate that her hosts, including film executive Jeffrey Katzenberg and his wife, shelled out $98,600 to McCaskill 2018 Victory. The families of the two other reported hosts, filmmakers Steven Spielberg and J.J. Abrams, also contributed $98,600, according to campaign filings. Among the other California billionaires to donate to McCaskill 2018 Victory in the weeks following the Obama fundraiser was Haim Saban, the mastermind behind the Mighty Morphin Power Rangers, who contributed $60,000. The most expensive tickets to Hawley's Tuesday fundraiser with Trump were $10,000, which got donors two tickets to the lunch and a picture with the president, according to a local news report. McCaskill is considered one of the more formidable fundraisers in politics. She reported receipts of more than $4.3 million during the most recent fundraising quarter, leaving her campaign with more than $12.2 million in the bank. Despite her claim in the email that she needs to "catch up to Hawley's fundraising ASAP," she has consistently outraised him and has four times as much in cash on hand as his campaign. McCaskill did not respond to an inquiry on the fundraising email. This entry was posted in Politics and tagged Claire McCaskill, Josh Hawley. Bookmark the permalink.